A new TV spot for the Ghostbusters reboot debuted last week that had certain corners of the fan community raising their eyebrow. And it's very strange that it is included in the marketing materials at all. But it's been cause for alarm for some people. And it's calling into question various aspects of this franchise restarter from director Paul Feig and Sony Pictures. The footage has Melissa McCarthy's Abby Yates cracking wise to Toby Huss' Officer Stevenson about the 1990 movie Ghost. Now, some fans are clinging to a new theory that this may prove the original Ghostbusters still exist in this rebooted world, and that it all ties into a phenomenon known as 'The Mandela Effect'. 'The Mandela Effect' is a very real thing, in so much as certain individuals truly believe that the conspiracy exists. And yes, it's what some might consider a wackadoo conspiracy theory. Whether it will be introduced as something that actually exists in this particular Ghostbusters storyline is not yet known, but some are clinging to it as a 'real world' scenario that could definitely explain what happened to the original Ghostbusters. Why Slimer exists in this new world. Why there is a Stay Puft Marshmallow Man. Why the original Ghostbusters all exist as other people, with the original stars taking on cameos. Basically, if 'The Mandela Effect' is not introduced in this first new Ghostbusters reboot, it is definitely a catch-all that could potentially save the franchise and might just give a sequel the zip it needs. First things first. The Mandela Effect Movie is probably around the bend, and it will give the uninitiated pause, allowing them one of those Arsenio Hall moments as one of the things that make you go, 'Hmm.' Basically, the Mandel Effect seems to be in place so people can deal with their selective memory. And there is far too much evidence that proves it is false. Though many want to believe. And if you say otherwise, these individuals get just as heated as they do about a new Ghostbusters starring an all-female cast. That alone makes perfect sense as to why, if Paul Feig hasn't already incorporated some of the ideas of the Mandela Effect into Ghostbusters 2016, he definitely should. It could straighten everything out with a fun nod to current idealisms held by actual individuals, some of them even scientists. Before we move forward, let's take a look at what the Mandela Effect is according to Wikipedia. "The Mandela Effect is a concept associated with Fiona Broome. It describes the situation where a number of people have memories that are different to available evidence. Broom says the name comes from several people having memories of Nelson Mandela dying in prison back in the 1980s, rather in than 2013. She argues that common memories which appear mistaken could be explained by the existence of parallel universes that are able to interact with each other. Andrew Friedman, a postdoctoral fellow at Massachusetts Institute of Technology, argues that the effect is really caused by fallible human memories, confabulation and that the notion that it is related to quantum physics is unfounded. The term has spread as an internet meme, a popular example being the claim that a number of people remember Berenstain Bears with a different spelling." Star Wars and Forrest Gump also tie deeply into the Mandela Effect mythos, and we suggest you look these up on Youtube, but be careful, there is potential to fall into a mighty big hole and never climb out. Some of these videos are not for the weak minded. Now, how does this all pertain to the new Ghostbusters? In the 2016 Ghostbusters movie universe, the original team of haint-hunting spirit chasers don't exist. They never existed. The world has never heard of Ghostbusting until Abby Yates (Melissa McCarthy) and Erin Gilbert (Kristen Wiig) introduce the concept in a means to save New York City from malevolent ghouls. Dr. Peter Venkman, Dr. Raymon Stantz, Dr. Egon Spengler and Winston Zeddmore have been written off into the dustbin of history. Though, in this new world, there are individuals running around who look just like them. This enables Sony and Feig to have a new franchise that doesn't rely on the original 1984 classic or its 1989 sequel. In 1984, Ghostbusters firmly took place in our current existence. There is enough evidence in that movie to suggest that it is supposed to be taking place in our real world. Sure, it's just a movie, but for the moment that it arrived in theaters on June 8, 1984, everything that existed in that movie also existed in our world. Star Wars, Twinkies and New York City. It diverges in that we, here, in the real world don't have Stay Puft Marshmallows, but for the most part, the movie and real world are one in the same. Though, when end credits role, that movie splits into its own separate universe. That said, the 1989 sequel suggests that the Ghostbusters brand is equivalent to what it is in our real world, with the guys having their own series of Toys and Merchandise and a party service to entertain kids. Both in that film universe and our own, the Ghostbusters exist as, at the very least, a thing. Everyone on screen, and in the theater, knows what a Ghostbuster is. And anything that came in its wake could inspire, influence and have a direct impact on both the real world and the fake one we are watching. 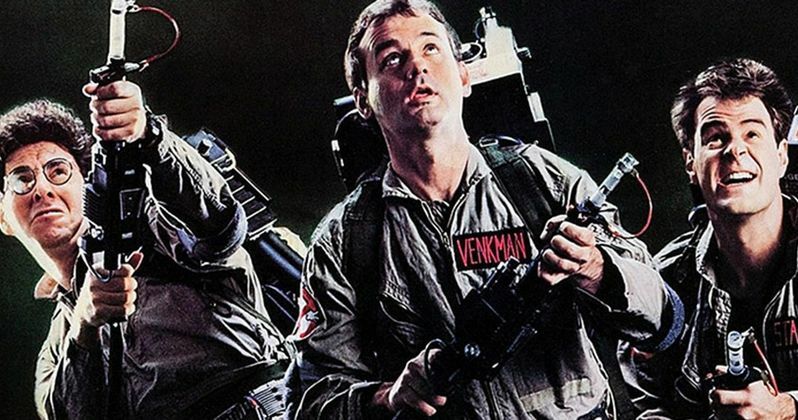 So, technically, a Ghostbusters 3 could still take place in our universe. As it stands. Everything is the same. Because the original used that real world notion and setting to introduce such an idea. Now, this is where a fatal flaw is introduced in having a world where Ghostbusters have never existed. Here, in 2016, you just can't have that. Look at how much the movie has influenced and impacted, especially in the way of art and all horror comedies that followed in the original Ghostbusters wake. Unless there is a joke in the movie about stealing the name from the original 1975 live-action TV show created by Marc Richards (which is often forgotten by fans of the Dan Aykroyd and Bill Murray version), that couldn't have existed either. This not only means that the 2016 Ghostbusters takes place in a universe different from the original 1984 classic, it also means that it takes place in a universe that is much different from our own real life universe. And if we're to believe all the screaming Ghostbusters fans who hate the idea of a new reboot, the original Ghostbusters had a mammoth impact on American society and culture. Inside the reboot, all of that has to be wiped away. Which is a notion not many people want to think about. They just want to be entertained. Which is why the TV spot from last week featuring references to Ghost have some groaning even louder than usual. How does the movie Ghost exist, when it was clearly influenced by Ghostbusters? Within the original Ghostbusters universe itself, that Patrick Swayze and Demi Moore classic could still exist. Because in that world, it would have the real world Ghostbusters to be inspired by. But not here. In the world presented on screen, everything stops being the same in 1984. From there, Paul Feig's movie must veer to the right and follow down a path pertaining to a world where no one, on screen or in the audience, has ever heard of a Ghostbuster or Ghostbusters as a movie. The entire social landscape would be different. Fruit Loops would be spelled Froot Loops and Berenstain Bears are the Berenstein Bears. Cats and Dogs living together, utter chaos. It's actually the prophesy as set up in the climax of the original brought forth by Gozer and his demons. So in steps the Mandela Effect...And it's all easily explained away. If the Mandela Effect is presented as real in the reboot, that's why the original Ghostbusters never exist. But they easily could, if these girls connect the two parallel universes that have slide together, giving some memories of that other life on the other side of the fence. It also helps explain why Star-Lord can reference Teenage Mutant Ninja Turtles in Guardians of the Galaxy, even though Howard the Duck doesn't exist in the comics that helped inspire that property, nor has he been introduced in that universe to planet earth, to help inspire that property on the other side of the screen. Basically, the position from some fans has become in recent weeks, the idea that if used properly, the Mandela Effect can easily explain why and how the original Ghostbusters have disappeared from the public consciousness. And it could help set up a sequel where the original Ghostbusters come back. Early reviews for the reboot claim that the movie ends with a reference to Gozer and his demons. And during the climax, the girls do go into a big portal. Is that the gateway? Are the original Ghostbusters hiding in there with the Berenstain Bears? We reached out to one of the more prominent voices who deal with the Mandela Effect. They chose to remain nameless, but had this to say about Ghostbusters converging with The Mandela Effect. And not surprisingly, they took a real world outlook on the situation that is, we assume to be a joke, but sort of frieghtening. "In 1984 I went to the movies on a Sunday in the spring and saw Ghostbusters. Everybody was laughing uproariously as the film played. Everybody but me that is. In the fall, I went back to see Ghostbusters again. This time I saw it with a double feature of The Karate Kid. Again, I didn't get what everybody thought was so funny about the movie with ghosts, slime and New York. Now, decades later, I finally understand why I did not get this seminal, 1980s film. Because it never existed. Based on all the evidence regarding Ghostbusters, the original film from 1984 wasn't original at all. How could it be? It never existed. On July 15, 2016, a film called Ghostbusters will be coming to theaters. This new film is in no way related to the one that everybody thinks they saw in 1984. Forget that this film features three white people and one African American person fighting ghosts just like that film you think you saw in 1984. Also, forget that they wore the same outfits and basically fought ghosts that look exactly the same. What's hard to forget is how the secretary in the ill fated 1984 film was played by Annie Potts, and in this new version someone thought that having Chris Hemsworth take on this role was a both a good idea and funny." We're not sure if he's joking or not, but this individual was much more suspicious of the real world repercussions of The Mandela Effect, and how, somewhat jokingly, the entire new Ghostbusters movie is actually making fun of the Mandela Effect to pull some of its power away. This unnamed source asks, "Could it be that in order to achieve The Mandela Effect, there needs to be a certain amount of confusion among those effected?" Yes. And like the Berenstain Bears misspelling, the fact that the genders have flip-flopped between Ghostbusters '84 and Ghostbusters '16 is in itself nothing but a big giant in-joke for those that believe. In a way, this forces us to examine The Mandela Effect and its not so casual relationship to the whole multiverse theory. This theory posits that there is hypothetical set of finite and infinite universes, and this includes the universe that we live in. So what is the relationship? Dan Aykroyd has a cameo in the new Ghostbusters as a taxi driver. Now, his role isn't a coincidence. He was one of the stars of the original, never before existed Ghostbusters from 1984. Might the multiverse and The Mandela Effect be merged to create an alternate time line that somehow brings forth the Ghostbusters that apparently never existed in the first place? Might it be possible that Dan Aykroyd's cab driver remembers (rightly or wrongly) that he was a Ghostbuster at one point and this forces him to cross the streams of the multi-verse? Lastly, our unanimous source points to one final bit of proof, backed up by the internet itself, however lofty that idea may seem. If one Google's Ghostbusters what comes up? Not the film from 1984 but the version coming out in 2016. If the original Ghostbusters was really this seminal of a film, it wouldn't be casually pushed down the list of searches by the 2016 film...Would it? With trailers for the 2016 Ghostbusters that have been universally despised, wouldn't this supposed 1984 version simply obliterate it? You would think they would...But as The Mandela Effect proves, what we remember and what is reality are two totally different things. And this whole notion could ultimately save what the Ghostbusters is about to become as a franchise. Especially if there is any hope of moving forward. We leave you with this. If you spell Stay Puft Marshmallow Man as MarshmEllow Man, that doesn't mean the Mandela Effect truly exists. It just means you're a bad speller with a lousy memory. True believers, Crucify if you will. Here's the TV spot that kick started this whole Mandela Effect fan theory in the first place in regards to the new Ghostbusters.